Edit: Coincidently, developer Jeremy Feasel Tweeted this tonight, almost right as I finished up this post! Apparently drop rates might have been adjusted, although it's not clear what reward exactly has been increased. Doubloons? Azerite Power? Pets/mounts? Seeing more drops on your Expeditions? I still stand by what I've written below, but it's good to see developers acknowledging some adjustments will/could be made to make Island Expeditions a more enjoyable experience. Still, I hope Blizzard takes into consideration what I've discussed. 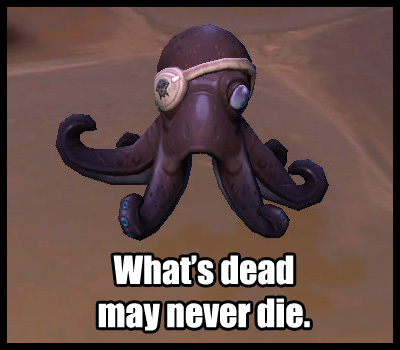 There are a total of 28 battle pets (one of which, Inky, is pictured above) that randomly drop at the end of an Island Expedition. Six of these are not cageable. At least one of these that we know of comes in multiple colors (permanently stays a color when adding it to the journal, NOT a color-changer), and players can receive duplicates. To put it bluntly, many pet collectors attempting to collect these pets are finding it extremely underwhelming and un-fun. It's currently unclear what factors affect whether or not players have a CHANCE to be rewarded a pet at the end of an Island Expedition. Yes, a chance, not even a guarantee, as players have met certain criteria multiple times (such as win or play on a specific difficulty), yet cannot produce consistent results. This makes it frustrating because it feels as if there is zero progress being made toward the end goal: collect all Island Expedition pets. It would help collectors feel much more inclined to continue the search for these pets if there were known factors to help guide them. Does Island difficulty matter? If so, how? Does winning vs losing mean higher chance for a pet? Do players need to defeat specific mobs during the scenario? Do players have to beat the other team by a certain margin or in a time limit? Any other information would be helpful and appreciated so collectors know they're not doing the "wrong" thing and are on the right path. No one likes to feel like they're wasting their time, and the feeling of realizing you could have been doing X instead of the incorrect Y is devastating. 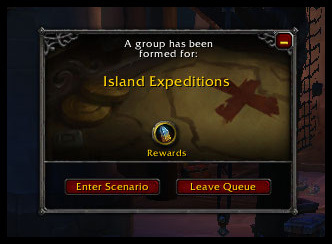 This combined with how awkward Island Expeditions can sometimes be, especially if in a PuG (it's a miracle if all members actually stick together and work as a team, instead of wandering off to do their own thing), makes these scenarios fairly tedious and not fun. Many collectors view it as a grind for the sake of a grind, with only the tiniest hope of a pet at the end. Giving collectors some information would absolutely give them a better idea of 'the how and what' rather than giving the generic advice to, "just run more and hope RNG is on your side." Knowing and understanding the factors would make it feel less hopeless and lacking in progress, which would make it a bit more enjoyable. In addition to letting collectors know 'the how and what' as noted above, I wholeheartedly would love to see these Island Expedition pets available for purchase with doubloons some time in the future. We don't have to call it a "catch-up mechanic", but ok, who are we kidding. It would be a catch-up mechanic. At the moment, I'm finding very little use for doubloons. I only very rarely buy the consumables that slightly boost my performance during an Expedition. There's just nothing really compelling me to do so. So in the end, the currency is starting to stack up and yet I don't have any real meaningful and fun way to spend them. It would be mercy upon all collectors if the Island Expedition pets could be bought with all of this new currency that we're accumulating. Especially toward the end of the expansion. Most of the time all we get is Azerite Power as a reward for completing an Island Expedition, but when Azerite Power doesn't matter as much anymore and would therefore be a less than mediocre reward, what's a more appropriate reward than to offer up pets to purchase in exchange for all of your hard-earned doubloons? Collectors would still need to grind these scenarios to collect doubloons; it's still random whether or not players receive any currency at all. There's no suggestion for a "freebie" here. Offering the option to buy the Island Expedition pets with doubloons would also give collectors a concrete objective. A tangible objective more often than not provides more motivation to grind out activities because players can actively see their progression. It would feel more productive, fun, and a better experience overall. Another suggestion that I've seen float around is to increase the drop rate of the pets, period. My only problem with this is that it doesn't necessarily address the problem with the piling up of doubloons and nothing fun to use them on. Not to mention duplicate pets can drop, and some would probably prefer having more control over which pets they receive in order to round-out their collections. Missing the X-colored pet? Ok, well I'll focus on collecting enough currency to buy it off the vendor and try my luck there. Edit: Another suggestion, "bad luck protection" for Island Expeditions. After X number of runs (could even be a range, such as 10 - 20 runs, so as to keep it RNG-esque) you're more likely to get a pet reward than not. Something like this could work too, although the RNG aspect of it could still prove frustrating. Some additional information would go a long way to helping collectors feel more willing to run these scenarios endlessly. Many are not against a grind, but if progress is invisible it makes it more difficult to continue. Many collectors would appreciate some consideration toward the Island Expedition pet rewards. Allow us to purchase them with doubloons - this will not take away from participation, as we'll still need to grind Expeditions for an RNG chance at currency. It will provide a specific goal for collectors, tangible progress, while also making use of the already existing currency. UPDATE: As of Patch 8.1, players can obtain an item, A Shady Message, which unlocks a follower mission. Complete this mission at your War Table (on your faction boat) to unlock a vendor that will sell the opposite faction's pets. Certain restrictions apply, such as the vendors will not sell pets gated by reputation or Bumbles, for example, which is locked behind an Alliance-only achievement. Currently the only known way of obtaining the item that begins the follower mission is winning a PVP Pet Battle match (queued). To my surprise, many of the vendor pets in BFA cannot be obtained in a straightforward manner. A lot have prerequisites, such as a certain quest or achievement completed, or rare elite killed, etc. If you don't meet the requirements, the pets will not appear on the vendor, or the vendor will not be available. After completing a prerequisite, you should receive some sort of in-game mail from the vendor that now has the pet for sale (not always the case, I've yet to receive any mail - this could be a bug). I've put together a list of details from Wowhead comments, WarcraftPets and the Bnet Pet Battle forum on how to unlock certain vendors and pets on those vendors. I'm almost positive that there are more vendor pets that have prerequisites, but I haven't been able to find info on them yet. If you know of any additional ones please let me know! Note: You do not have to do the quest chain to "save" Nigel before completing the process below. Click on the chest a second time (consumes the chocolates), Nigel will appear and be a vendor. Horde - Complete Killing Cannibals, Just Say No to Cannibalism and Shoak's on the Menu to get this NPC to appear in Gloom Hollow, Nazmir. Alliance - Head to 55,36 and find Kajosh. Complete the quest chain. Shoak will appear in the Horde camp, Gloom Hallow (Alliance can interact with him, but you'll agro the camp). There are 8 battle pets in BFA that require reputation with a specific faction. Some are Neutral and can be earned by any character, while others are faction-specific. Thankfully all of these pets are cageable, so if you don't have one toon for both Alliance and Horde, you might be able to trade/buy the opposing sides' pets.